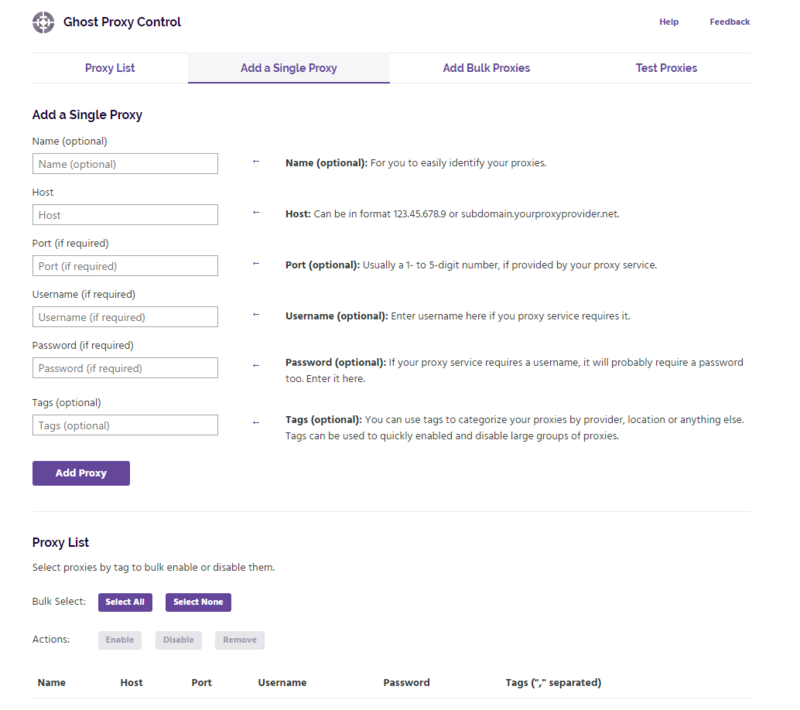 What is Ghost Proxy Control? 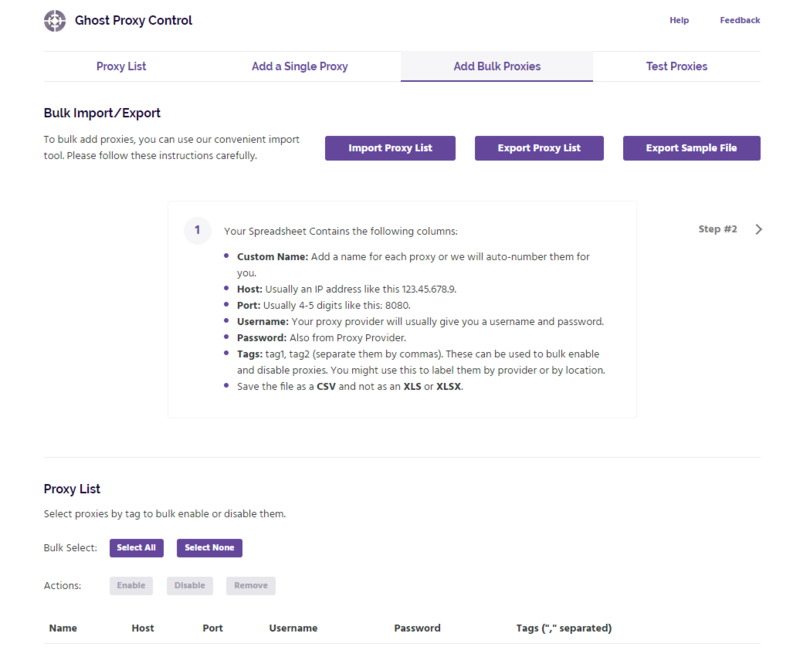 Ghost Proxy Control is an extension created custom for Ghost Browser that allows you to assign a different proxy (IP address) to each tab, Session, Task or Identity in Ghost Browser. Proxies make it appear that you are located in the same place as the proxy server. You may need different proxies in order to test websites or log into accounts as if you were located in a different state in the US, in the UK, or Germany, for example. 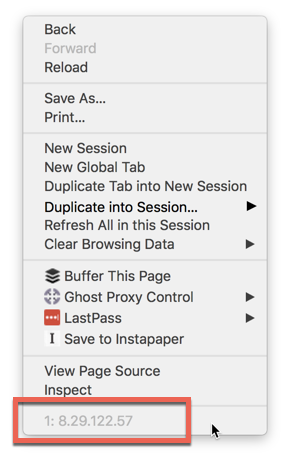 You can use this extension to easily assign any proxy to a tab, Session, or Workspace in Ghost Browser. For your convenience, the Ghost Proxy Control extension comes pre-installed with Ghost Browser. If you signed up for Ghost Browser recently you were given a 14-Day Free Trial of both Ghost Browser and Ghost Proxy Control to start. At the end of that trial you can still use it but you need a license. You can get one here. When your 7-Day Free Trial expires, you'll need to purchase a Ghost Proxy Control license in order to enable it in the browser. Go to the Ghost Proxy Control Page, and choose either a Monthly or an Annual subscription and click Get the Add-on to add it to your cart. If you already have an account, click the Login button to sign into your account so that your Ghost Proxy Control license will be linked to your current account. If you are new to Ghost Browser create an account. Once you create or are logged in to your account check the box to agree to the terms of service. Fill out your credit card and billing information. Click the blue Purchase button. 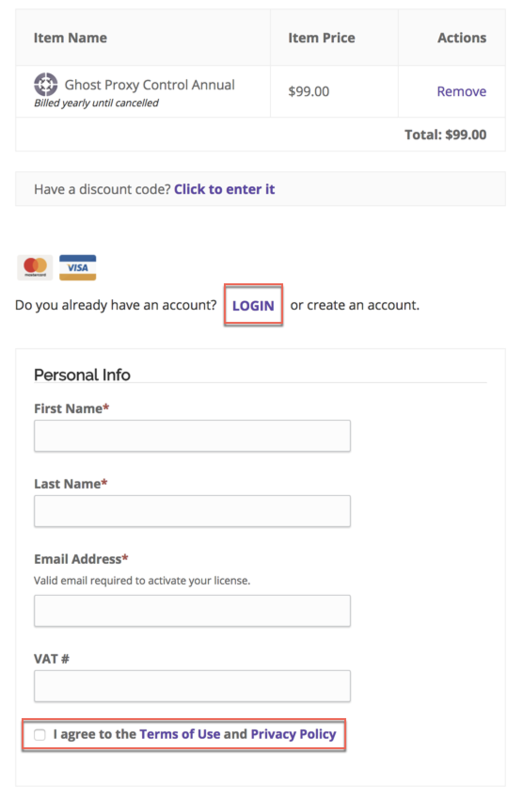 You will be redirected to a Purchase Conformation page that includes your subscription details and link to download a .pdf invoice. Your new license will now be automatically tied to your account. If you need to assign this license to one of your team members click here for instructions on how to assign a license. Your Ghost Proxy Control extension should now be automatically enabled and you should see the below extension icon in your extensions tray. If you don't see this icon follow the steps below. Check the box next to the Ghost Proxy Control extension to enable it. Below is a screenshot of what the extension looks like when it is successfully enabled. If it won't enable please fully quit and restart the browser. 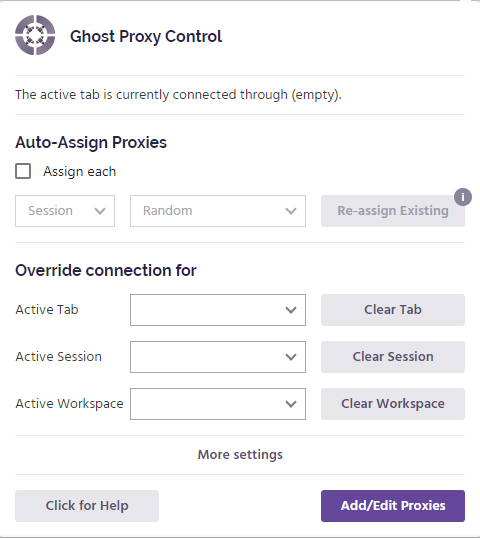 Ghost Proxy Control is a proxy management extension that allows you to assign a different IP address to each tab, Session or Workspace in Ghost Browser. The extension does not come pre-loaded with proxies, you must bring your own proxies to use Ghost Proxy Control. For instructions on how to add SOCKS5 proxies to Ghost Proxy Control, please scroll down. For instructions on how to bulk upload many proxies to Ghost Proxy Control, please scroll down. From the drop-down extension window, select Add/Edit Proxies. The Ghost Proxy Control settings page will open. Click Add a Single Proxy at the top of the page. Enter the required information about the proxy and click Add Proxy. 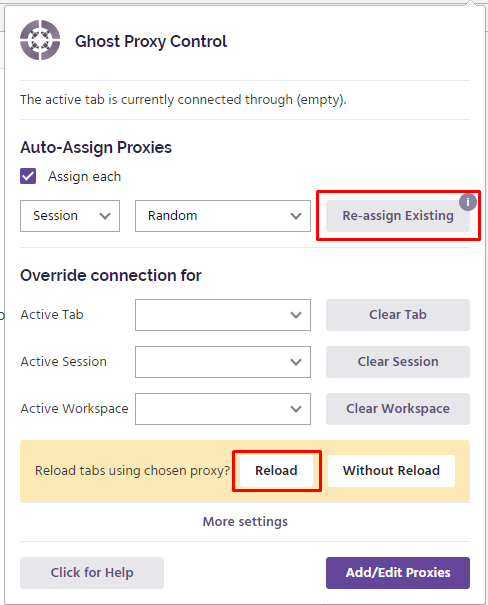 Now that you've added a proxy to Ghost Proxy control, scroll down to learn how to assign a proxy to the active tab, Session or Workspace in Ghost Browser. If you only have a couple proxies, it may be faster to add them one at a time. Scroll up for instructions on adding them manually. From the Ghost Proxy Control window, select Add/Edit Proxies. The Ghost Proxy Control settings tab will open. From the instructions that appear, click the Export Proxy List button to download a pre-formatted .csv file. Note: This .csv file will include any proxies you have already added. If you want to keep these proxies in your list, keep them on the file. Do not add or change column names. Enter proxy information in the .csv file and save the file. Do not change the name of the file. The Custom Name column is required but if you leave this blank, we will automatically number each proxy (1, 2, 3, etc.). From the Ghost Proxy Control settings tab in Ghost Browser, click the Import Proxy List button. Select the updated proxy list .csv file and click Open. 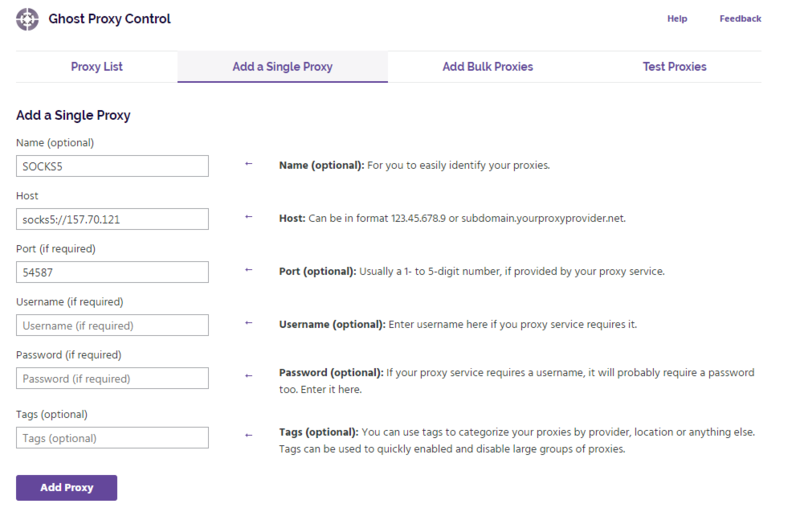 You'll see your proxy information has been uploaded into the Ghost Control Proxy settings page. You can assign a specific proxy to the active tab, Session or Workspace. First it's important to understand the proxy hierarchy to use the Ghost Proxy Control extension effectively. If you set a proxy in the Override connection for section, it overrides the Rotate through my proxies for each Session feature. If you assign a proxy to a tab, it overrides any proxy assigned at the Session or Workspace level. Likewise, if you assign a proxy at the Session level, it overrides any proxy assigned at the Workspace level. Click the menu to assign a proxy to the Active tab, Session or Workspace, and select which proxy you'd like to use. - Direct (no proxy): Routes traffic back through your direct connection. - System Proxy: Uses the system proxy (if any) you set at the browser (via PAC and/or 3rd party extension) or OS level. After assigning a proxy to either the tab, Session or Workspace level, you can confirm the IP address was assigned correctly in two ways as described below. These methods can be used to confirm the correct IP address was assigned at the tab, Session, or Workspace level. Right-click on a web page and your IP address will display at the bottom of that context menu as seen in the screenshot below. Open a new tab in the same colored Session as the Session you'd like to check and Google "what is my IP?" 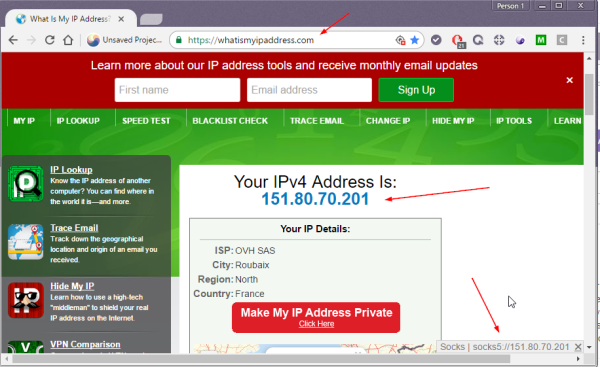 It will show you your IP address at the top of the page. If enabled, this feature automatically assigns a proxy to each new Session you open. Proxies will be cycled through, starting at the first one and going to the last one, and then starting over. Under the "Auto-Assign Proxies" section, check the box to Assign Each and chose the needed Session. You can reassign proxies (in order, starting at the first one and going to the last one, and then starting over) to all open Sessions. Click the Re-assign Existing button in the "Auto-Assign Proxies" section. Click Reload to rotate through your proxy list to all open Sessions. The host must explicitly have a "socks5" scheme before the IP address. As seen in the screenshots below when entering SOCKS5 proxies to your Ghost Proxy Control extension you would configure it the same as regular proxies, just with the SOCKS5 scheme first. So as seen below, in the Host field, you would enter "socks5://151.80.70.201"
Enter the port, and if it has a username and password enter them in the fields. Once added you can test your proxy by either clicking the Test button to the right of the proxy, or you can assign that proxy to a tab in Ghost Browser and use a site like whatismyipaddress.com or whoer.net to test that it's working correctly. You can clear the proxy for the active tab, Session or Workspace. 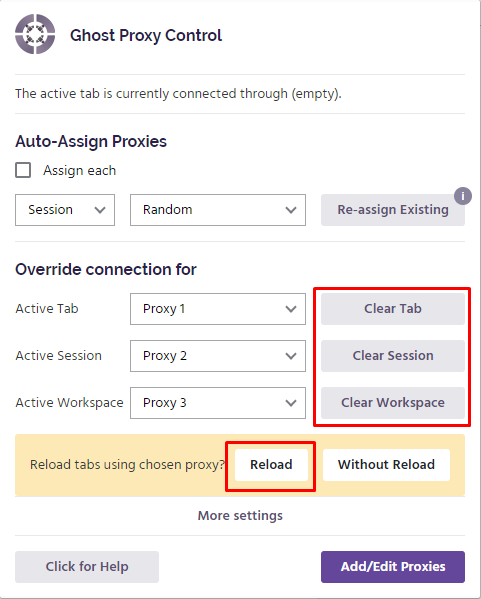 If you clear the proxy for the active Session or Workspace, the proxy will be removed for all tabs in the Session or Workspace respectively. If you don't currently want to use the Ghost Proxy Control just leave the extension 'Enable' box unchecked. The extension will be there should you decide to use proxies at another time.